Its time to open the review thread. I know some of the IMAX theaters have sneaks today. Gorgeous, informative and as gripping as a shark's jaws, "Under the Sea 3D" reps the apotheosis of the Imax 3-D form. Trying to curb Jim Carrey's improvisational enthusiasm as the narrator of the IMAX documentary Under the Sea 3D was not easy, but the extra effort was worth it, according to producer Tina Myers. 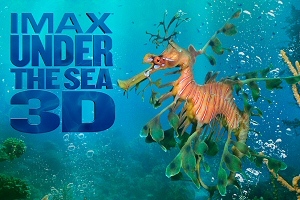 A casual observer might accuse the Imax crew of riding the wave of the 3-D craze with Under the Sea 3D, in which beasties from wondrous waters engage our senses. Last edited by TNPihl on Sun Feb 15, 2009 7:59 pm, edited 1 time in total. I think it'll be reviewed well, usually these type of films do pretty solid. 90% so far on RottenTomatoes. Edit: Now has a 94% at RT with 17 reviews. I might be going to my IMAX this weekend to see it. Should be fun. Under the Sea 3D runs 42 minutes, making it perfect for family outings, but it's a rare film that would enchant at double the length. I really loved the movie and it was super! Was Jim's voice in the majority of it? Seen it tonight. It was good for what it was, but there's nothing special about the movie that you couldn't see on Planet Earth, besides the fact it was 3D and has Jims voice in it. My dad and I just saw it at a new local IMAX theater today and we found it to be short but sweet. The 3D really blends well with the movie. There were times when the creatures were coming out of the screen that I couldn't help but reach out for them. My favorite 3D moment was when a cod slowly came closer to me and I happen to give it a good chin rub. Plus it's fun to pet the white seals. Jim did a great job narrating the film. His sounds quite pleasant in his narration and he still finds a way to add some humor to his narration. My favorite line from his narration is when the little stingray was hiding in the ground and Jim says, "dude, I can still see your tail." Overall, it was very very worth watching for both Jim, the 3D experience, and my first look at the Christmas Carol teaser which I'll talk about in another forum post later. You guys should check it out if you haven't.